Bicycling magazine has had a long on going effort to get more people riding bikes. They threw out the challenge again this year and encouraged people to get someone they know to get on a bicycle and start riding. Challenge accepted and for the first time yesterday in about 20 years my girlfriend rode a bicycle! I have to admit it wasn’t all my doing and it’s something she wanted to try for a while, but the timing worked out and we rented her a bike (a nice Giant Defy) from the local shop and headed over to the local university where they have a nice 3 mile loop with little traffic and a decent surface to ride around. There was a little trepidation at first and some fleeting thoughts of falling down. But after a quick instruction my sweetie was off peddling around the parking lot before I could even get my helmet on! Soon enough we were out on the loop and the easy gear I had set up the bike in was too easy so we did a little on the road shifting instruction and there was no stopping now! By the end of the first lap she was shifting the front and rear like a champ and handling the bike very well and we were just cruising around the campus enjoying our time together. The proof is in the smile! In all we completed 3 laps of the campus is about an hour. We weren’t setting any KOMs, err… QOMs, but for the first time out in 20 years she did very well and I’m so proud of her. Unfortunately the rental had go back today but we will probably rent it again, maybe for a week while we start the process of shopping for her very own bike! 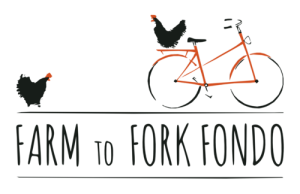 This past weekend I participated in a new cycling event, the Farm to Fork Fondo. The idea behind the event is to support local farms and farming organizations. Each rest stop on the ride was held at a different farm which featured treats made from the farms or other locally sourced items. Proceeds from the event would be donated to local farmers and organizations to help them with project and other causes like preserving the beautiful open space we all enjoy on our bicycles. This particular event was hosted in Orange County, NY, but there is a second event coming up in Vermont in two weeks. The event is put on by former pro Tyler Wren & Wrenegade Sports and major sponsors of the event are Colavita and Fine Cooking magazine so besides the bike rides there are other activities (dining, cooking classes) throughout the weekend, depending on what “package” you choose. There was also a Q&A session with the Colavita | Bianchi womens pro team the morning of the ride as well. The OC event is hosted at Cedar Lakes Estates which hosts a whole mess of other off the bike activities as well. At the OC event, there were several different routes to choose from; the Gran Fondo @ 94miles, the Medio Fondo @ 60 miles, the Piccolo Fondo @ 30 miles & the Ramble Ride @ 10 miles. I signed up for the Medio Fondo @ 60 miles with an estimated 3,700 feet of elevation gain. Since I haven’t been able to get in many long distance rides in this year I figured that was more than enough. Plus since the Cedar Lakes venue is basically on top of a mountain that meant a mountain top finish to the ride! Here you can see the elevation chart from Ride With GPS. The weather report for the weekend was all over the place. First it was supposed to be a complete washout then only Saturday was going to be bad with it clearing up early Sunday morning for the ride. Of course the forecasts were all wrong and there was a light on and off shower with about an hour to go which turned into a good downpour about 30 minutes before the start. It finally stopped, or at least slowed down with about 10 to go, so the organizers pushed the start back a half hour to allow some of the water to run off. After all we would be descending out of the gate with wet brakes so no need to add lots of run off to the mix as well. Garmin 1000 or Magellan Cyclo 505? For about a year now I have been using a Magellan Cyclo 505 and my cycling computer/GPS navigation device. It’s been a good device throughout that time but it hasn’t been without its problems. When it was first released in the US & AU in April of 2014 (the UK already had it for a year prior) it came with software version 4.0. It worked right out of the box, paired with my Bluetooth sensors perfectly and worked as expected. Bluetooth was important to me as I already had those sensors from when I was using my iPhone. If I had gone with a Garmin I would have needed to replace those senors with ANT+ versions. Unfortunately my good fortune wasn’t experienced by everyone and there were many reports of users suffering from what was dubbed the “distance doubling bug”. What would happen is when some people paused their ride (either manually or automatically) and then resumed their ride the Cyclo would double the distance they had traveled. In some cases the error would correct itself later in the ride, other times it wouldn’t and sometimes it would propagate itself to the Magellan Cyclo website where rides are uploaded to. Thankfully services like Strava disregard many of these false stats and re-calc the rides themselves. Support tickets were created and users were assured a fix was in the works. Fast forward to October 2014 and 4.1 was released which was to take care of the distance doubling bug. For some uses it did just that, but for others, like me, it actually introduced the bug into their rides. Of course I updated right before a 100k charity ride which got recorded as 469575.82 miles instead of the usual ~60 miles. After some testing and compiling of data from users on the CycloGPS.com forum we figured out the bug only seemed to affect certain BTLE (Bluetooth Low Energy) sensors and did not seem to affect ANT+ sensors at all. I logged a ticket and was told a fix would be out in about “2 weeks” which seems to be their standard line, which equates to about 6 months. To band-aid the problem some users just stopped using sensors, others took the magnet off their wheel and just used GPS speed or others, like me, went out and purchased ANT+ speed & cadence sensors. So what once was a selling point for me mattered no more. Maybe I don’t ride in the right groups but whenever someone starts talking to me about their MPH on this or that ride I just start to tune them out like Charlie Brown’s teacher. Now don’t get me wrong, I love stats as much as the next person and always look over my ride data on Strava after a ride but I don’t think it’s particularly interesting to someone else for me to tell them that my average speed on my 20 mile loop is up by .4MPH. 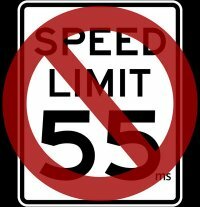 Now, bragging rights aside, I’ve have been on group rides in the past where some riders will take this to the next level and will refuse to walk their bike at a rest stop because their computer will average that slow wheel speed into their stats. This usually results in them picking the bike up, or at least the rear wheel and roll it on the front only (or vice versa depending where the speed sensor is). In a few instances these same riders would break traffic signals, signs and laws to not stop on their bike – now that just downright dangerous and insane. I refuse to ride with the group if these individuals have signed up for the ride. Coincidentally enough these are the same people who fail to call out road hazards when they are on the front. Probably don’t want to increase their drag by pointing out the hazard. I just think sometimes we worry about the numbers too much and forget to just enjoy the ride.